Get your furry friend up to date on the latest Mardi Gras fashion with this beautifully knit, Mardi Gras Fleur De Lis dog sweater. 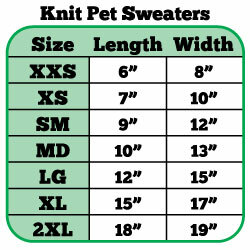 We know that you can already see in your mind how awesome this sweater will look on your dog. The Fleur De Lis dog sweater is adorned with beautiful rhinestones in vibrant Mardi Gras colors. This dog sweater is durable and will hold up over the years and will look great on your dog anytime of year, any place you go. Purchase this Mardi Gras Fleur De Lis dog sweater for your 4 legged friend now.